Sujata Nerurkar spearheads the Teacher Training Courses at Param Yoga. She conducts sessions and trains teachers in traditional yoga, vinyasa (power) yoga, Pranayam and pilates sessions. Her classes have students from beginners to experts and teachers. 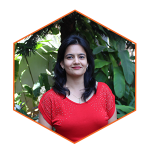 Educated in Engineering and Management, Sujata now enjoys working full-time in the field of Yoga. Her 12-year experience in the corporate sector gives her the unique capability to be logical and process-oriented in running the organisation while using her passion for Yoga to take her students beyond asana technique. This exceptional combination of skills equips Sujata to conduct workshops on Yog sutra, Asana alignments and adjustments, Yin yoga, office yoga, and management of emotions. She also shared her learning through a column on holistic wellness in a Mumbai-based newspaper, Navshakti. 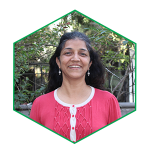 Sujata’s passion for Yoga is apparent through her students’ progress both in asanas and in their personality. Indeed, she derives her satisfying smiles from her students’ eureka moments – physical, mental, and emotional.